«©NCSX» Cloud is what we would consider a sympathetic hero. While awe-inspiring with his innate skills and abilities, we nonetheless pity him. Cloud suffered an agonizing loss in Final Fantasy VII and he suffered from Geostigma in Advent Children. His eyes betray a great sadness within but he shoulders onwards nonetheless. We'd advise him to go Goth and dye his blond locks black to match his somber aura. 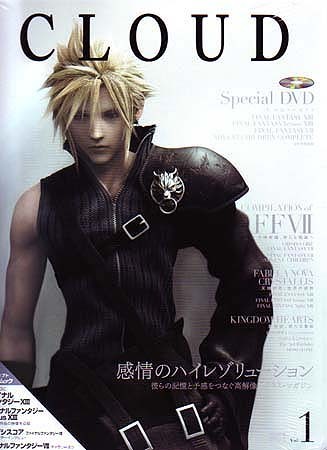 Square's got a cottage industry centered around Cloud and the company produces a 122-page book and DVD which focuses on the tragic hero and the games that he's featured in. Yes, we're aware that the mook was released in mid-December 2007 but better late than never? The Final Fantasy XIII trailers are stunning with trademark flashy style and heroes who are impossibly perfect. None of Square's protagonists will ever sport adult acne or even an out of place whisker. To be a Square hero is to be perfectly coiffed and painstakingly fit. Maybe that's the "fantasy" part of the equation. All in all, the Cloud mook is something that'll be treasured by fans of the Final Fantasy series. Fans who also happen to adore Cloud will be in seventh heaven. Everyone else ignorant of the Cloud phenomenon will look at the cover art and think, "Why is that chick so depressed?" or "Dude is the leader of a hair band." View larger photos for Cloud Vol. 1 on the main NCSX website. Cloud's unisex fragrance is made of mandarin, lemon, bergamot, melon, peach, and apricot which is backed by Lily of the Valley, jasmine, rose, freesia, carnation, and cyclamen.